Our action-packed trip to Namibia was coming to a close. All that was left was a six-hour drive through the desert from Walvis Bay to Windhhoek, a quick overnight at the local Hilton, and then a short, two-hour flight home. What we did not count on was car trouble, and a run-in with some less-than-friendly locals in the pristine and orderly German town of Windhhoek. Saying goodbye to the Pelican Point Lighthouse in Walvis Bay, we locked our luggage in the covered rear bed of our rented truck, threw our backpacks and camera bags in the back seat, and began our journey to Windhhoek. We had chosen to take the slightly longer “scenic” route, on the advice of our guide, and hoped to see some animals along the way. Once we left the now familiar sand and hit the hard pavement in Walvis Bay, our truck began to shimmy violently. Bouncing over sand berms two hours a day for the previous three days must have knocked a weight or two loose from one or more of the tires. Mind you, this was no ordinary wiggle of the steering wheel. This was a make-your-arms-numb, rattle-your-brain kind of shimmy. Walvis Bay is a small town, and we were short on time, so we decided to just deal with it. We’re tough like that. Of course, after about ten minutes, I was ready to turn around and go back. Hubby, on the other hand, was determined to stay on schedule. Once we hit the dirt road leading into the desert, it was hard to tell the difference between the rattle from the tires and the rattle from the road. Hubby’s answer to that was to just drive faster. My head was pounding and my teeth hurt, but I held my peace. If he could stand it, then so could I.
Thankfully, there was plenty of beautiful scenery to take our minds off of the car. The barren desert gave way to green mountains, as we bounced along with the road nearly to ourselves. The few cars that did come along appeared to be in a great hurry, and had apparently never been taught to share the road. Each time, we had to swerve to avoid being hit. We also got a nasty crack in the windshield when a large truck flew past us, showering us with sand and rocks. A large pebble imbedded deep into the glass – nearly coming straight through! Oh well, at least we had insurance to cover the damage, and after we made our one-and-only turn, we did not see another car for more than two hours. 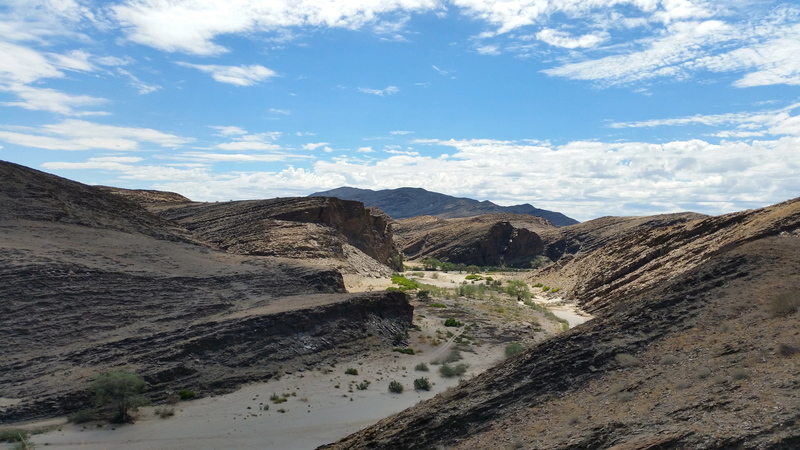 A “river” in the Namib-Naukluft National Park. 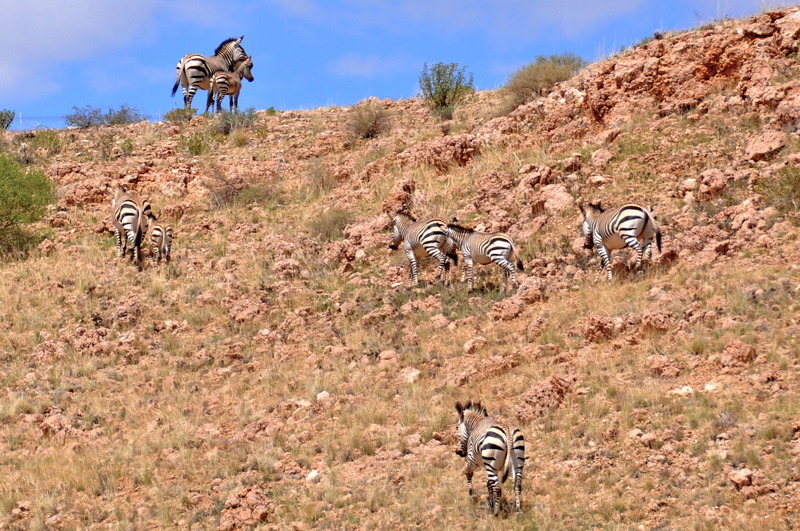 Our first animal sighting was a herd of mountain zebras, grazing along the road. Our approach sent them running, but we did manage to get a few nice shots. 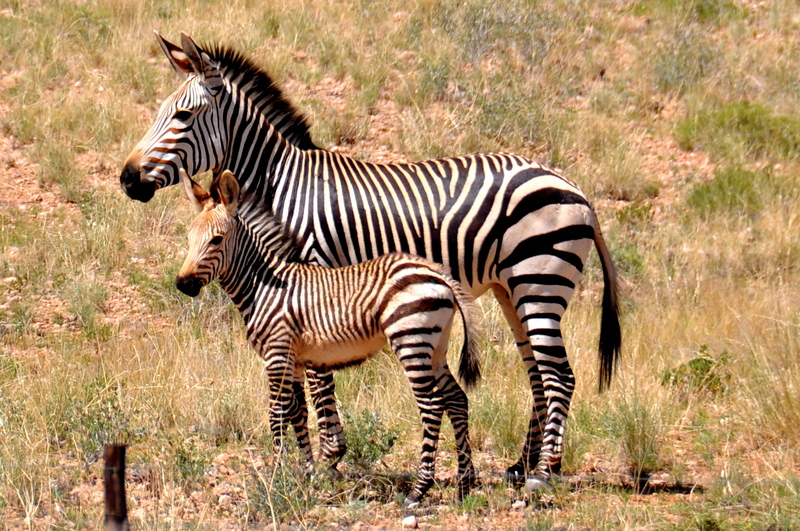 Zebras in Namibia. Such pretty markings! 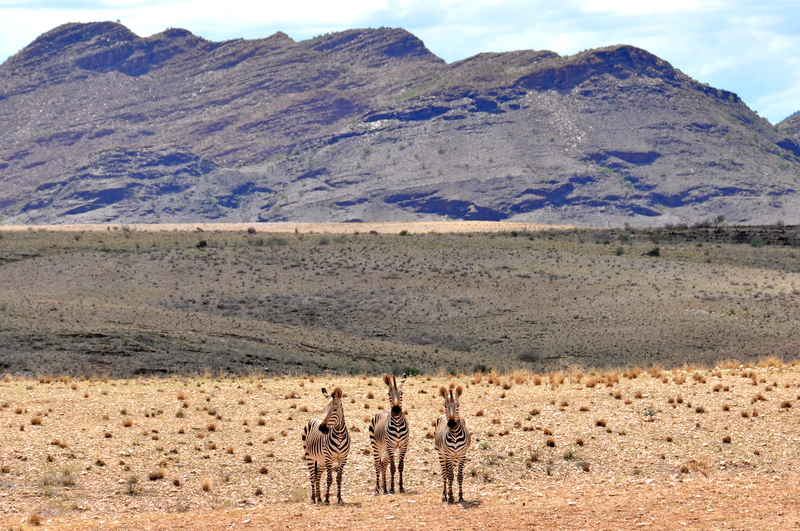 One of several herds of Zebras we saw in the Namib desert. Next, we encountered a group of springboks, also beautifully marked. As their name implies, they spring into the air as they run, which makes for quite a sight! 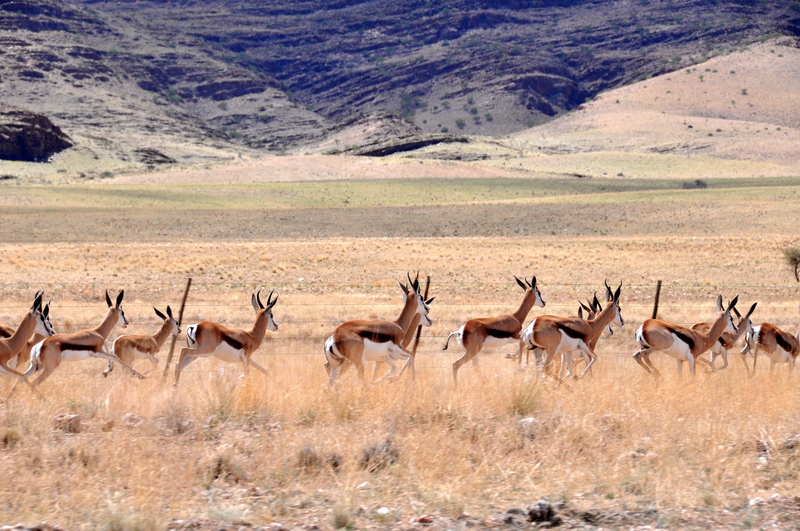 A herd of springboks. I tried to capture one of them leaping, but they are too quick! 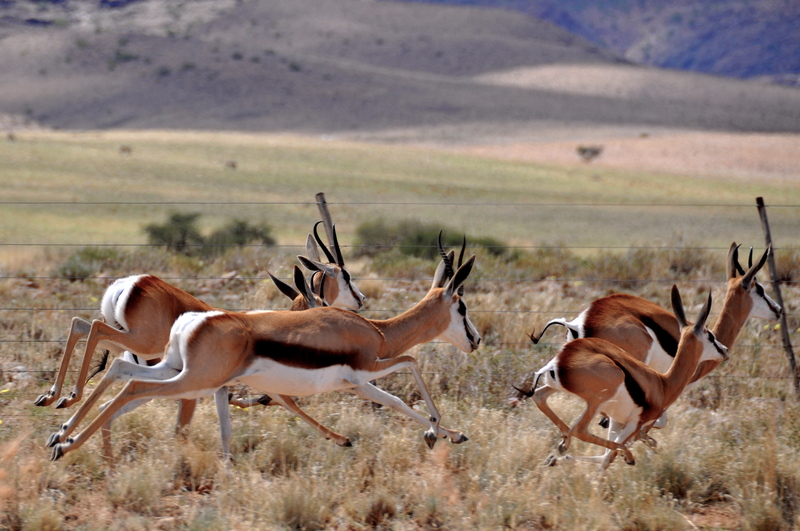 More springboks, so fast and agile. 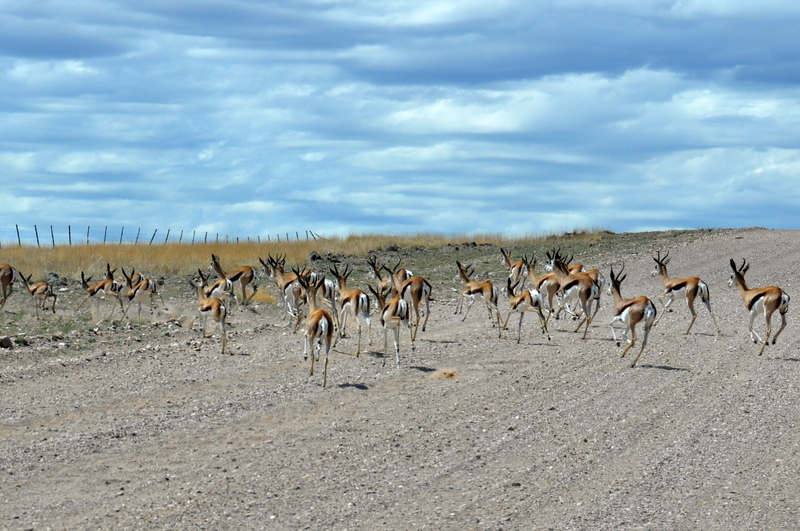 Springboks running along beside us, as we drive through the desert. 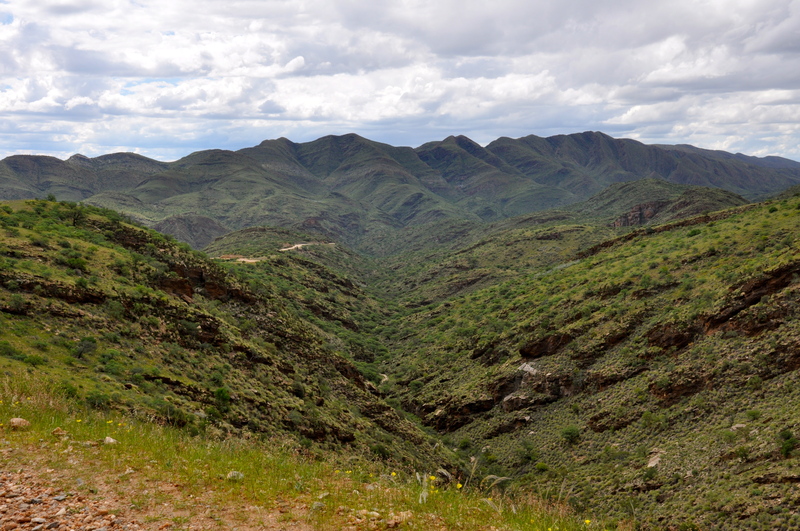 Along the way, we encountered more mountain zebras, a large Kudu, baboons, and numerous birds. Zebras striking the perfect pose. 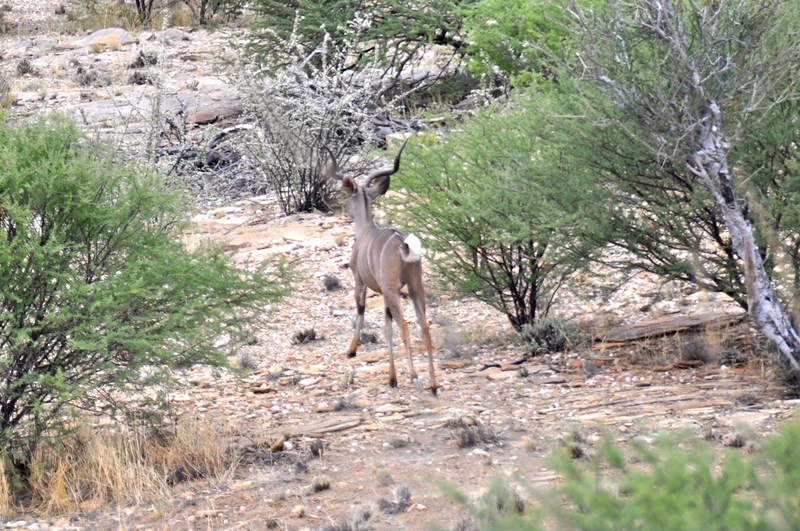 A large kudu, the only one we saw on the drive through the desert. 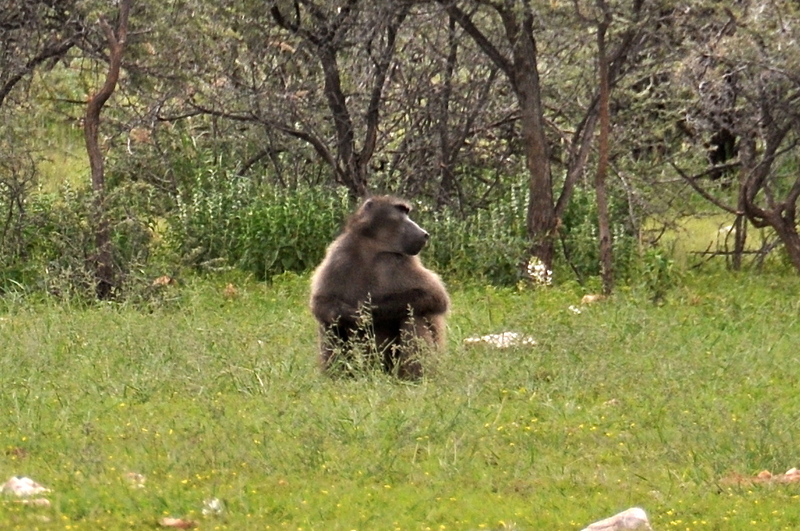 A large baboon taking a break in the sunshine. As we approached Windhhoek, the scenery continued to get greener, almost lush. This was undoubtedly due to recent rains and not the normal look for the area. 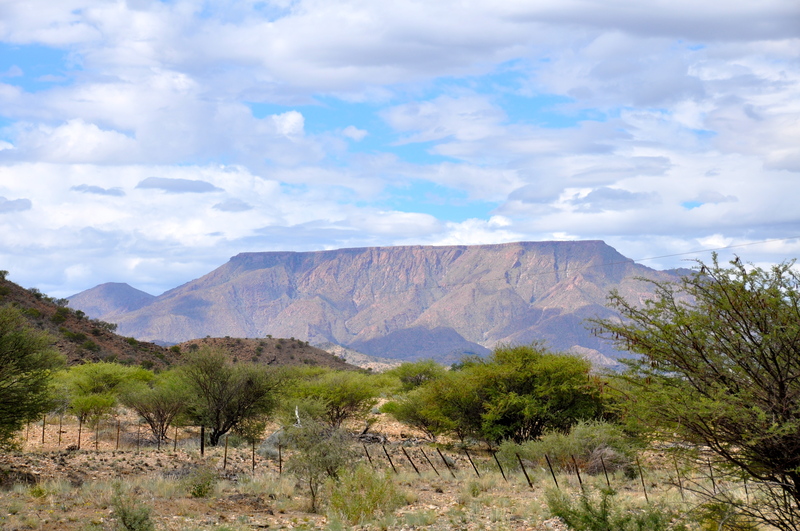 Beautiful flat-topped mountain in the Namib-Naukluft Park. Unusually green mountains from recent rains in the area. Once back on the hard pavement of Windhhoek, we realized that the shimmy was gone. We guessed that the remaining weights on the tires were shaken loose as we rattled along the dirt road. That’s one way to fix an out of balance tire! We plugged in the Sat-Nav and input our hotel name, planning to stop at a nearby craft fair on the way. Not wanting to drag our backpacks and cameras into the fair, we searched for a place to pull over and lock them in the back compartment with our luggage. The streets were busy with cars and pedestrians on every corner, and all street parking seemed to be full. We approached an intersection, with plans to turn right and make the block again, but the car in front of us stopped and sat in the middle of the intersection. We were unable to go around due to foot-high concrete barricades on both sides of our lane, and so we had no choice but to sit and wait for the numbskull to move. Suddenly, men on both sides of us opened all four of our car doors. Terrified, I grabbed my door and began to wrestle it closed, nearly slamming it on the would-be robber’s fingers. Make no mistake, I would have snapped his fingers off in a New York minute, but he moved his hands just as I managed to close and lock the door. I quickly reached behind me to close and lock the back seat door as well. Then, I looked over my shoulder to see the man on the other side of the car grabbing my husband’s backpack. Hubby jumped out of the car and yelled, “Hey, you!” Not exactly a menacing threat, but I guess it did the trick. The robber dropped the backpack on the seat and ran off, just as the car in front of us finally started to move. Once we realized neither of us was hurt, we did our best to slow our pounding hearts, and take stock of the situation. What was missing? Where did the robbers go? Once we found a place to pull over and count our bags, we realized they were all there – and that the whole situation had been a set-up. The barricade had created a trap and the stopped car in front of us had played a role as well. We had been incredibly lucky, as our bags held passports, money, cameras, etc. But, we had also been incredibly foolish for making such rookie mistakes. You see, we had both forgotten where we were. Windhhoek looked so clean and civilized, we let down our guard and fell into a false sense of security. Displaying a Sat-Nav and having visible bags in the back seat was just dumb. And driving along with unlocked doors was even dumber. We live in Africa, for heaven’s sake! We know better. Needless to say, we won’t make those mistakes again. Truth be told, these things can happen anywhere, even in Texas, so it is always best to avoid looking and acting like a wide-eyed tourist. Never again. Despite the poor welcome to Windhhoek, we managed to make it to the craft fair and buy a few treasures. 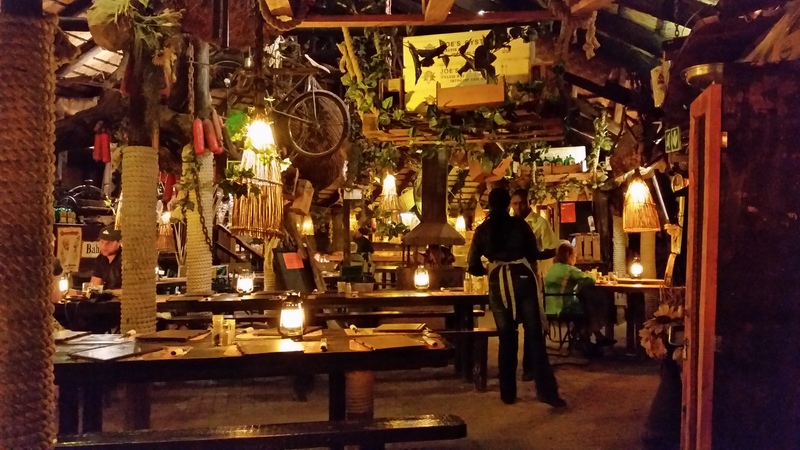 After checking into the hotel, we also had a nice dinner at a popular local eatery called Joe’s Beerhouse, known for serving excellent game meats. We both enjoyed our kudu and oryx steaks, more tender and flavorful than even Texas prime beef. Blasphemy, I know, but true. Our flight back to Luanda came off without a hitch, and we still marvel at all we had done in just seven short days. Despite a few bumps (literally), our trip to Namibia was a true joy, and we hope to return someday. But next time, we will remove the “I am a tourist. Please rob me.” stickers from our foreheads, lock our doors, and keep the Sat-Nav on the down-low! ©2015 – Cheryl. All Rights Reserved.